High oil prices (more than triple their level ten years ago). High oil prices cause people to cut back on discretionary spending, leading to layoffs in discretionary industries and debt defaults. Governments get less revenue in taxes at the same time they need to increase spending for unemployment benefits, bailing out banks, and stimulus funds. Result: financial problems for governments of oil importing countries, including many Eurozone countries and the United States. More free trade with Asian countries starting about 2001, when China joined the World Trade Organization. This change sent many jobs to Asia, and also holds down wages in US industries that compete with companies using overseas labor. Lots of baby boomers becoming eligible for Medicare and Social Security, starting about 2011. This is a problem because taxes, in practice, need to cover the cost of benefits on a cash flow basis, which is the way US handles its financial accounting. As a practical matter, this is the way the world economy works as well–the goods and services used today are created by today’s workers, with resources pulled out of the ground today. Carryovers in terms of goods are very limited–mostly a little grain. A health care industry that is able to charge fees that are increasingly out of line with the wages of common workers. None of these issues looks likely to improve in the near future, suggesting that we are encountering a long-term problem that is only likely to get worse. In this post, I provide charts showing that if the US funding problem is fixed through higher taxes on individuals (including proprietors), the needed fix would require additional taxes averaging approximately 15% of each person’s wages. If oil production remains relatively flat, as it has since 2005, additional tax increases even above this level will likely be needed later, as higher oil prices lead to more layoffs, and more need for government spending. The first approach is being considered by others. I see drawbacks to it that others may have overlooked. The second two approaches are admittedly nonstandard, but need to be at least considered. I am not very optimistic that a way can be found around the fiscal cliff. The problems are too much “baked into the cake”. But if we don’t understand what the magnitude of the problem is, and what is causing it, it is hard to make good decisions. The “standard” way of looking at government income and expense is as a percentage of GDP. As a practical matter, though, about 80% of federal taxes relate to individuals, so it makes more sense to me to use a wage base for comparison, especially if there is concern that wages aren’t keeping up with GDP. Also, while the issue at hand is federal taxes, from a taxpayer point of view the real issue is total taxes–Federal, State, and Local, including Social Security and miscellaneous taxes. If we compare total government expenditures to estimated taxpayer wages1, we see that in calendar years 2009 through 2011, expenditures exceeded 65% of wages (Figure 1). 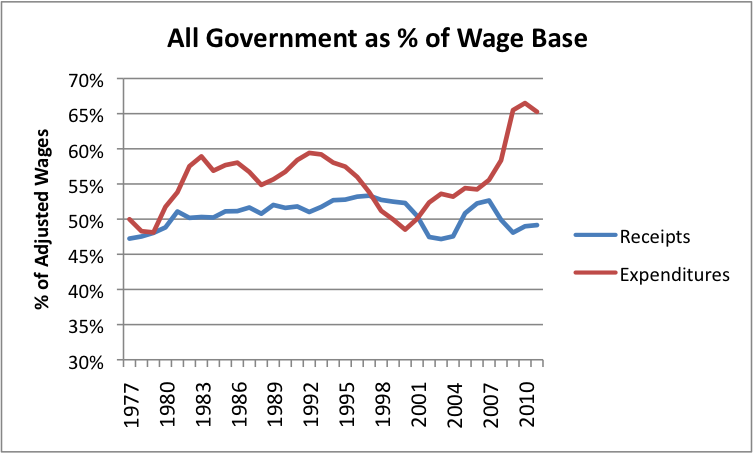 Total government receipts have averaged around 50% of wages, currently slightly less than this benchmark. Figure 1. Government expenditure and expenses for all levels of US government combined (including federal, state, and local and Social Security), based on Table 3.1 of the Bureau of Economic Analysis. See Note 1 for definition of wage base used. Based on Figure 1, we either need to raise taxes by a little more than 15% of wages, and keep raising taxes in the future to keep up with an escalating problem, or we need to cut back on government benefits, such as unemployment insurance, Social Security and Medicare. Either of these actions can be expected to have a very adverse impact on the economy. If citizens need to pay much higher taxes, they will cut back on discretionary spending. Such a cutback is likely to lead to more layoffs in discretionary sectors, and more recession. If benefits are reduced, those directly affected will be very unhappy. There may even be civil disorder. In addition, those with reduced benefits are likely to cut back on their spending, leading to recession. They may also default on loans, leading to bank problems. Of course, the Fiscal Cliff discussions are about fixing only a little bit of the problem now, and making plans to fix small amounts in the future. The real issue, if we understand the four problems listed at the beginning of this post, is that we are facing an escalating problem. This is especially the case if world oil supply remains relatively flat, as it has been since 2005. Figure 1, shown above, showed a combination of Federal, State, and Local government income and outgo (including Social Security, Medicare, etc.) as compiled by the US Bureau of Economic Analysis. Figure 2, below, shows the corresponding figures for State and Local Governments. Figure 2. State and Local Government Revenue and Expenditures based on Table 3.3 of the Bureau of Economic Analysis, expressed as a percentage of the same wage base as described in Note 1. A person can see from Figure 2 that Income and Outgo are fairly well in balance for State and Local Governments, but there is a problem with both taxes and benefits rising over the long term. This contributes to the long-term unhappiness citizens feel about taxes in general, even if the problem is not federal taxes. While it may seem surprising, the Federal deficit discussions relate to all government spending other than State and Local government.2 Thus, besides regular budgeted spending, the Fiscal Cliff discussions consider Social Security, Medicare, the Federal Government’s portion of Unemployment Insurance, and un-budgeted military expense. If the Federal Government should become obligated in the future to bail out government organizations, such as the Pension Benefit Guaranty Corporation or the Federal Deposit Insurance Corporation, these costs would presumably need to be considered as well in determining whether there is a balance of income and outgo. Probably of the biggest areas of funding shortfall is Medicare (Figure 3, below). Figure 3. Medicare Revenue and Expenditures by Fiscal Year, based on Tables 2.4 and 11.2 of the Historical Data of the White House Office of Management and Budget. Social Security is better funded, or was, until a decision was made to cut employee contributions by 2% of wages, for calendar years 2011 and 2012. This was done as an off-budget stimulus to the economy. Figure 4. 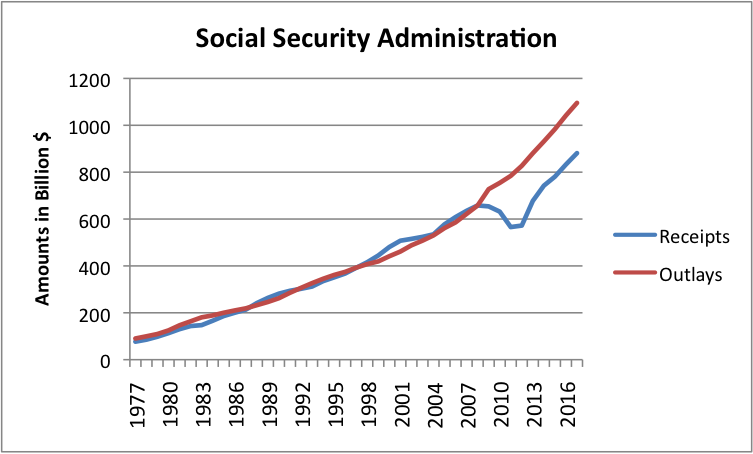 Social Security receipts and outlays, based on Tables 2.4 and 4.1 of the Historical Tables of the White House Office of Management and Budget. The current plan seems to be to return to the original tax rate effective January 1, 2013. This return to the original tax rate does not seem to be reflected in the White House Office of Management and Budget (OMB) figures I am showing in Figure 4. Even if this change is made, it is my understanding that there is still some need to raise Social Security taxes. Another grouping on budget reports which has some revenue associated with it is Income Security, shown as a functional category on OMB report 11.2. This grouping seems to include the federal portion of unemployment compensation. It probably also includes Food Stamps. It too shows a shortfall. Figure 5. 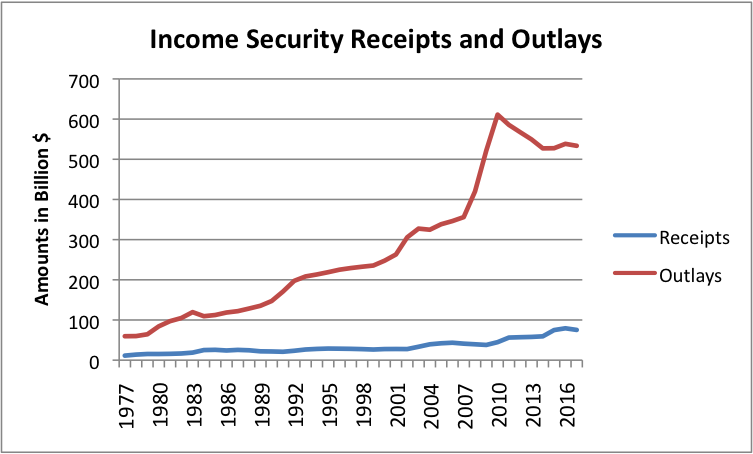 Federal Income Security receipts and outlays from Tables 2.4 and 11.2 of the Historical Data of the White House Office of Management and the Budget. 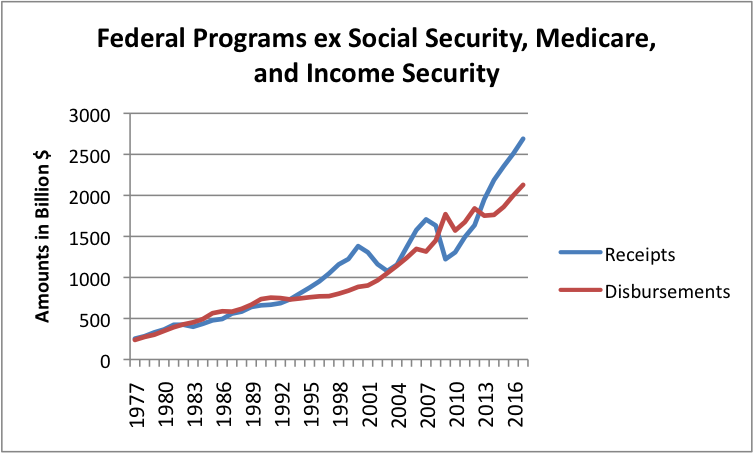 If it were somehow possible to erase the problems with these three programs (Medicare, Social Security, and Income Security), there would still be a federal revenue shortfall, but a manageable one. In several periods, there has been a surplus on this basis (Figure 6). Figure 6. Comparison of Receipts and DIsbursements for Federal Programs excluding Medicare, Social Security, and Income Security, based on Historical Data of the White House Office of Management and Budget. 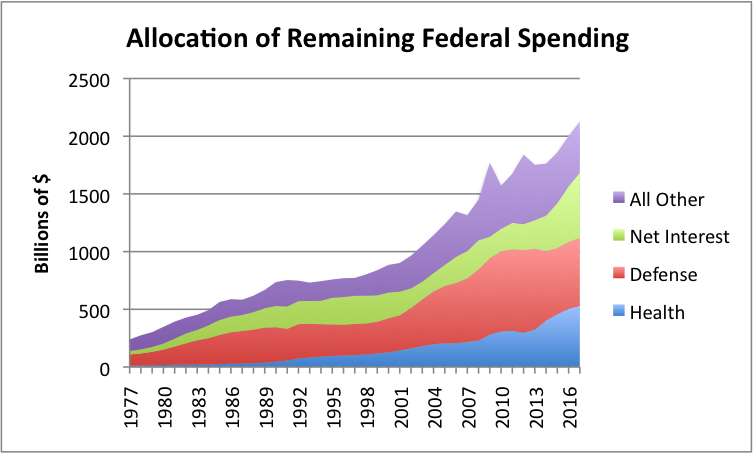 We can break down the remaining federal spending (as shown in Figure 6) into some major groupings. Figure 7. Allocation of Federal Spending, other than that for Medicare, Social Security, and Income Security, based Historical Data of the White House Office of Management and Budget. Health, at the bottom of Figure 7, would seem to include federal funding related to state Medicaid programs. The bulge for future years reflects the new federal healthcare program. Defense, shown in red, is very large in recent years, but is forecast to shrink in the budget forecasts of the OMB. Net interest is reflects a netting out of interest paid and received. This is a different accounting treatment that a person sometimes sees, with Social Security being credited with some portion of interest payments. Here, all interest is in one location. Recent interest payments have been very low, thanks to the artificially low interest rates now in effect. Interest payments are forecast to more than double by 2016. Figure 7 shows that the “All Other” category is quite small, compared to the $1 billion+ in deficit that we are facing on an ongoing basis, if funding stays as in the recent past. This would correspond roughly to federal government programs where the expenses are mostly salaries of government employees, rather than transfer payments to citizens. I calculated this amount by subtraction of the selected pieces from the total. If we use the same wage base as with Figures 1 and 2, the ratios of income and disbursements to wages are as shown on Figure 8 below. Figure 8. Federal Government Revenue and Expense (including Medicare, Social Security, etc.) as percentage of Wage Base described in Note 1. The current high outgo doesn’t look as high relative to prior years, as it does in Figure 1, but looks can be deceiving. 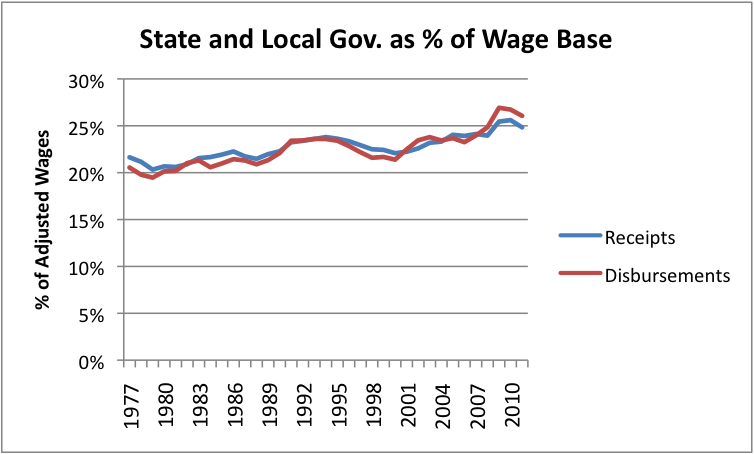 Figure 2 near the beginning of the post shows that state and local taxes have been increasing–from roughly 20% of wages in the late 1970s to 25% (or more) now. So total taxes “feel higher,” even if the federal part doesn’t rise by much. The federal government has paid for some of this rise in state programs, through federal funding of local programs. The temptation now will be to cut back on federal funding. If there is a goal to keep total state and local taxes to less than 50% of the wage base, then it would make sense to get federal spending down to 30% of wages, or below 30%, if there is a cutback in federal funding of state programs. If federal payments look to be headed for 45% of wages, this would mean that federal spending for all programs combined would need to be cut back by one-third (=(45%-30%)/ 45%). Alternatively, of course, taxes can be raised–but with the caveat that taxpayers get very unhappy about taxes over a certain level. Figure 9. 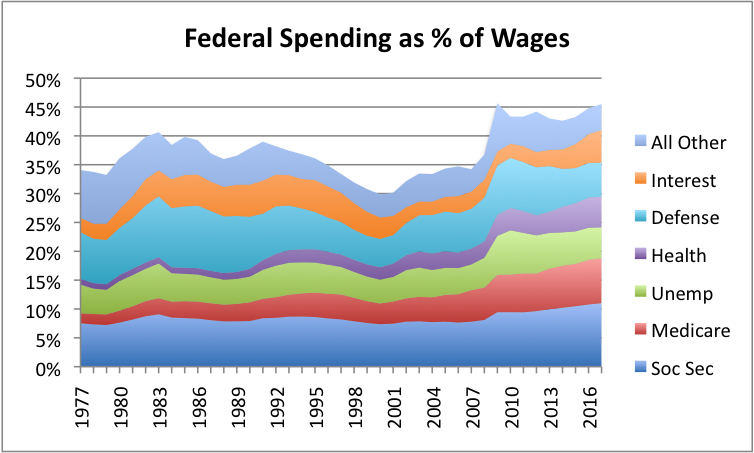 Federal spending as a percentage of wages, broken out by category, in stacked chart. 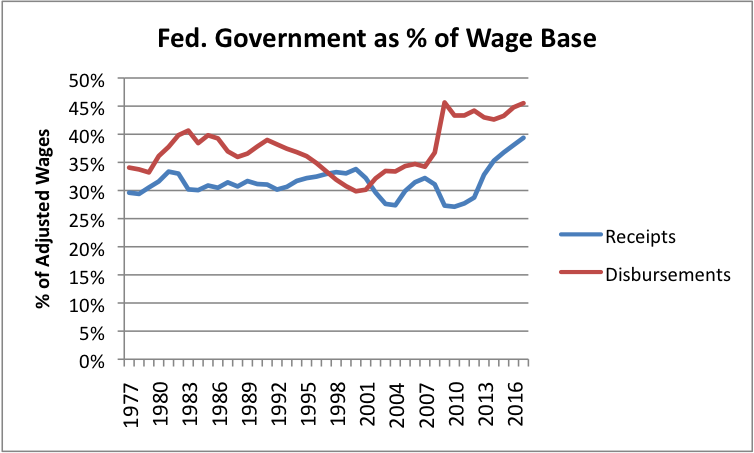 Spending based on White House OMB data; wages as described in Note 1. 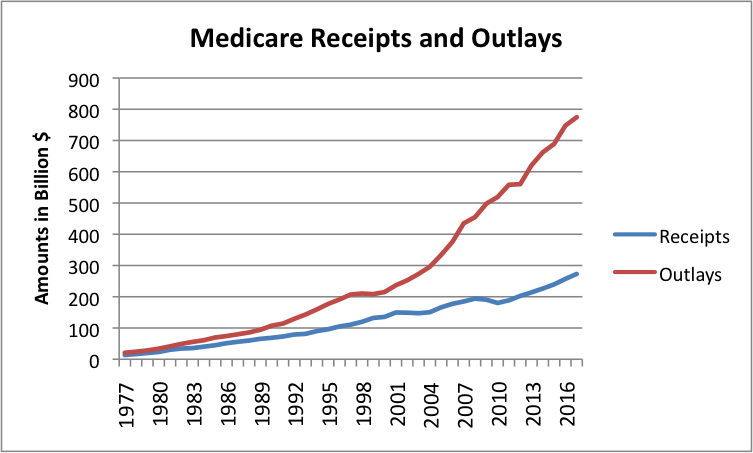 The biggest run-away program is Medicare. It will be difficult to fix it without making a lot of people unhappy. Defense can be cut back even more than it has been, but that leaves a lot of unemployed military people as well as unemployed people who work in defense industries. Send programs back to states. Perhaps the easiest way for the Federal Government to reduce spending is to turn programs over to the states, offering some sort of small “block grant” to fund them. Then, if the program is unsatisfactory, it is the problem of the state, not the federal government. Richer states will be able to provide better programs than poorer states. The federal government’s role will gradually be reduced. The downside of this approach is that programs are likely to be greatly reduced in scope. The federal government will become less and less important in the whole scheme of things. Fix Health Care Costs. US healthcare has been on its own track for a long time. It is far more expensive than the systems of other developed countries, and the quality of results is not very good, according to studies such as this one by Commonwealth Fund. 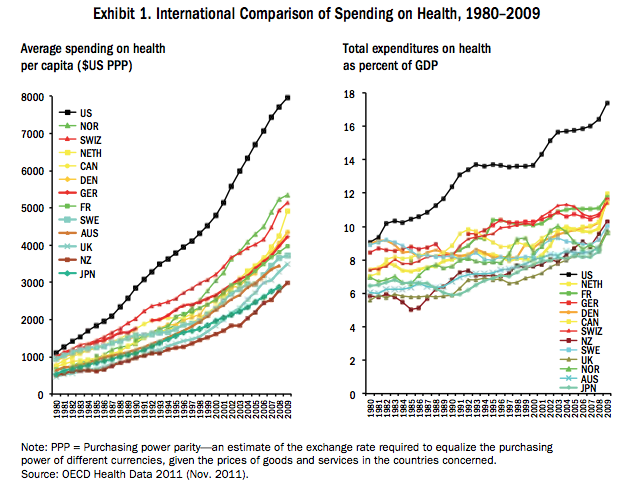 Figure 10. International Comparison of Healthcare Spending, from Explaining High Health Care Spending in the United States: An International Comparison of Supply, Utilization, Prices, and Quality, by David A. Squires, The Commonwealth Fund, May 2012. Perhaps a change closer to the Japanese system of regulation could be coupled with more emphasis on healthy eating and exercise. The major losers in such a change would be surgeons and other specialists earning very high salaries, investors in very high-priced devices, pharmaceutical companies who charge US customers more than elsewhere, and hospitals that need to scale back services to be more in line with what other developed countries provide. A partial solution might be to penalize companies that outsource jobs to parts of the world with lower wages (but this would be hard to enforce, and likely run afoul of free trade agreements). It would theoretically be possible to re-impose tariffs on selected categories of imported goods and services, to try to encourage more local hiring, even if it means higher production costs. Again, this has free trade agreement issues. A related issue is the idea of businesses being able to incorporate offshore, and escape US taxation. I know my work as an insurance actuary involved a lot of work for “offshore captives“. Somehow, we should be rethinking whether allowing US companies to take the benefit of these offshore services, without tax, inside the United States, is in the United States’ best interests. Shouldn’t we be taxing goods and services produced elsewhere, to avoid US taxation? There are many other issues that deserve a more complete treatment, including further discussion of the four causes of the increasing deficit at the beginning of this post. I have treated some parts of these issues in other posts, such as High Price Fuel Syndrome. Wages used as a base consists of “Wages and Salary Disbursements” for both employees in government and in private industry, plus “Employer Contributions for Government Social Insurance” plus “Proprietors Income” relating to both “farm” and “non-farm”. All of these amounts are from Table 2.1, Personal Income and Its Disposition. For most people, this will be the nominal wages a person receives (before deductions of any kind), plus the amount paid by the employer on behalf of the employee for Social Security and Medicare contributions. I have not included “Transfer Payments” such as Social Security, Medicare, Medicaid, and Unemployment Insurance, since these are likely not to be heavily taxed. For projecting future years wages, I have assumed 3% annual growth (1% increase in labor force and 2% inflation). If there is recession or if the number of jobs fails to rise, this assumption may prove to be too high. There is a small overlap between federal and state programs. For example, the Federal Government gives State and Local Governments to spend on unemployment benefits, and on Medicaid, and on stimulus projects. The data sources I am using should remove these overlaps correctly. This entry was posted in Energy policy, Financial Implications, News Related Post and tagged federal taxes, fiscal cliff, health care, high oil prices, income taxes, oil prices, oil supply, recession, taxes. Bookmark the permalink. According to a recent report from the Congressional Budget Office (CBO) the fiscal cliff (by virtue of taking billions of dollars out of the economy) would drive the U.S. into a recession next year and increase the jobless rate to 9.1% by the end of 2013. In addition, the CBO said economic output would drop by about one half of one percent in 2013 if Congress fails to act to reverse the tax increases and spending cuts put in motion by an earlier deficit agreement. It starts to take effect in January and includes $7 trillion worth of tax increases and spending cuts over a decade. In addition, the debt ceiling — the legal limit on federal borrowing — will need to be raised by early next year from its current level of $16.394 trillion. It is not surprising that raising taxes and cutting benefits would push the country toward recession. The tendency of high oil prices to push the country into recession has been covered up in various ways, including deficit spending. If part of the cover-up goes away, the recession is back. Surprise! Here are a few thoughts on climate change, fossil fuel use, politics, the Fiscal Cliff, and markets. Dan Allen gives us a quite doomerish view of an uninhabitable United States due to drought and/or nuclear waste pool meltdowns. Steve Keen tells us how the United States government and its citizens escaped from the debt situation which led to the Great Depression and which financed WWII. Steve relates those experiences to current discussion about the Fiscal Cliff. Paul Gilding gives his upbeat assessment that business and political leaders know that our current path is unsustainable, and that, in the end, humanity will do the right thing and leave hydrocarbon reserves underground. The Christian Science Monitor talks to people about drought and how to adapt. I will pretty much accept at face value Steve Keen’s insights and Paul Gilding’s forecasts as a basis for discussion. I won’t debate the issue of whether renewable energy can actually replace fossil fuels. If by doing so we cut the standard of living in rich countries by 75 percent, so be it. I will focus on the water issue. When Joe Romm talks about dust-bowlification in one of the click-throughs in Allen’s article, please note that the drought of the early 50s was worse than the drought of the 30s. I was growing up in northern Oklahoma during that drought, and recall day after day with temperatures above 115, nighttime temperatures of 90, and the river through town being virtually dry. Yet the agricultural disruption in the 50s was much less than it was in the 30s. How could that be? Farming methods had changed and crops had changed. Wheat, which is adapted to dry conditions, had replaced diversified subsistence farming. Most fields had a shelter belt of trees around them. And the fields were contoured to sink water into the ground. The swales were planted in grass to control erosion. Those practices grew out of the New Deal. There weren’t any massive dust storms in the 50s. If you look at the Monitor article you will see that Joel Salatin in Virginia has made his farm quite drought resistant. One strategy is to build a lot of ponds. Another strategy is to build soil so that it holds more carbon and thus more water. If you checked a little further, you would find that Joel built a raft and floated it in one of the larger ponds and grows vegetables on the raft. So the irrigation water for the demanding vegetables is right underneath them. In the Monitor article you will also see that the Governor of Kansas recognizes the ability of the farmers to make their farms more drought resistant. First, I don’t doubt that the standard of living in the rich countries is going to decline. I expect that the rich countries will not be able to restart any boom which will allow for graceful deleveraging. While it may take years for the climate to change, financial markets might collapse tomorrow. So I would think that a smart individual or family or extended family will seek to insulate themselves from financial debacles. Second, Gilding may be right over a decade, but it won’t happen tomorrow. So climate is going to get worse in most of the US. So I would think that a smart individual or family or extended family will get pretty deeply involved in food and pay particular attention to water and nutrient cycling. Third, the politicians need to get out of the way and let the market reveal just how severe the costs of climate change are. No bailouts for the Hurricane Sandy victims, no drought relief money for the Plains, no expensive preparations for sea level rise in Florida. Once people and the markets understand that government is not going to bail anyone out, some sensible things will start to happen. Third, the politicians need to allocate scarce money and fossil fuels to just a few things that are critical for survival. Water conservation and the restoration of waterways are an excellent way to spend money and fossil fuels and can provide a lot of jobs. Building new highways is the activity of the brain dead. Fourth, the politicians need to make some commitments to carbon levels AND THEN HAVE GOVERNMENT AGENCIES REFLECT IN THEIR FORECASTS THE AMOUNT OF CONSUMPTION CONSISTENT WITH THE FORECASTS. Suppose the IEA put out a forecast showing zero hydrocarbon usage in 20 years? Would the markets wake up? Would the markets rethink the value of the automobile companies? Would the WTO continue to push its insane policies? What value would be placed on companies with large reserves of hydrocarbons? Fifth, the politicians need to make it clear that the welfare state is dead. Government actions will be aimed at helping those who are helping themselves…such as making land available for community gardens. Not giving people food stamps. Extirpation Nation: How much of the US will be habitable in 50 years? One issue with climate change is that feedback loops are very long. The climate is changing; it will likely continue to change, whether or not we do anything now. Our children or grandchildren may benefit if we do something now, but I am doubtful that even if we stopped using fossil fuels tomorrow, it would have much of an immediate impact (except to reduce global dimming from burning coal, and from that point of view, raise global temperatures). There is also the issue that the climate has never been very stable. We built lots of infrastructure thinking it would be, and at some point it will be in the wrong place. This is all very frustrating. With the long feedback loops, I don’t think we will know what is sensible policy (other than to just get along with what we already have) for a very long time. I do agree though that continually protecting people against the impacts of bad decisions tends to lead to more bad decisions. A big part of the reason that so much development has taken place along coast-lines and river-fronts is artificially low insurance rates (through the government flood insurance program, or through suppression of private insurance rates in high risk areas) as well as expected government bail-outs. I know some of the big bail-outs this time are for the electrical companies that made the electrical repairs, expecting that the government would reimburse them. I suppose that their other option would be raising rates, and getting the amount back from citizens/businesses in the area. Regarding your solutions, I expect it will be hard to make them salable. Basically, we have put policies in place which in some ways do away with “survival of the fittest,” both in human lives and in terms of business investment. If there is not enough to go around, someone will have to be left out. I would like to see the tax code changed, so that there is not a tax penalty for poor people to get married. Women should not be better off if their husbands leave them. Beside the tax code, this is tied in with food stamps and other programs. Birth control and abortions should be free and readily available. People who are disabled are a real issue. As the mother of an adult with autism, I am aware that the disabled tend to be the first fired and the last hired. Under survival of the fittest, they would be left out. Going out of our way to save very low birth-weight babies who have an above-average chance of being disabled as adults does not seem like a productive use of resources.